I bought an Atari 800 a couple of months ago. But with only 48Kb, I won't be able to use SpartaDos X.
I can wait for the next production run of Incognito but in the meantime, I need another solution which is Axlon compatible. I am not a hardware guru so I searched for a 256Kb upgrade on the net. And some articles by Claus Buchholz here in this forum. The first 3 articles have the same overall approach and use almost the same components. I wanted to understand the differences in a logical diagram to be able to choose one. So I took the excellent diagram from Jerzy Sobola and, for each upgrade, I drew in red the modifications. I wanted to share this work with every one, This is what you will find in the archive. The second goal of this article is to simplify the upgrade and check with hardware gurus if my changes are right. I took the first one (by David Byrd) and tried to make changes to keep the addressing cycle explained in RAMSLOTS article so there is no need to cut traces in other boards. 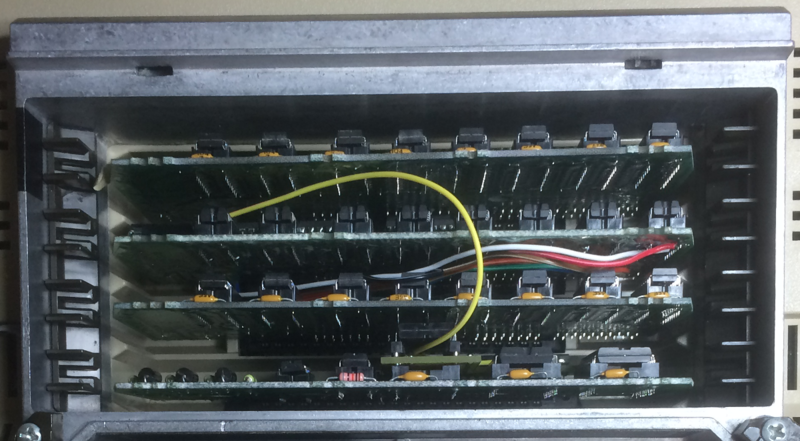 And I also removed the wires to the backplane so there is only the ROM board and the 16Kb board in Slot 2 to change. Of course, without mother board wires, the 2 boards (ROM and 16Kb) need to be connected board to board. There is only one wire which is missing: the RES M pin from the CPU board was wired to the MR pin of the 74LS175. I don't know if I can live without this wire (I guess yes but I need advices). Thank you for telling me if this version could work or if I made a mistake. Edited by ebiguy, Sun Sep 13, 2015 4:30 AM. Is the 512K, 800 upgrade from Bob Hays Axlon compatible (up to 256K)? I got one of these in the 90's, and it came with a modified version of MyDos 4.5x. I tried writing to Bob, but although his we site is still up, the email bounced. Maybe he is still around here? I was thinking that this might be a possible alternative to a roll-your-own upgrade. Of course, if you want to do a project, then off-the-shelf is not what you want. Nice work on the drawing. The circuit looks good to me except for the refresh counter. I don't think the JK flip flop as wired will cover all 256 refresh addresses. It looks like you got that from Byrd. I talked to him on the phone in the day - nice guy - and told him that but he insisted he tested it. The trouble is that screen DMA covers refresh requirements by itself so any testing in normal text mode is not sufficient. A custom display list could reveal defficiencies in the refresh circuit. Look at my design in the Quarter Meg article - it works even with screen DMA off. Ignore the Windhover docs. Torres copied my and Byrd's designs and then ranted that we copied him. Nice, huh? I am happy that you took time to check the diagram. I am not an hardware expert and the problem with the refresh counter is not clear for me. I understand that you are talking about the wire from RASTI pin on the edge connector to the CLK pin of the 74LS112. I just downloaded your article and red it but it does not help me. I am not an expert so comparing two projects which are different does not help. Could you tell me how I can change the diagram to fix the problem with the refresh but with the minimum changes. I mean, I would prefer fixing this upgrade than restart from scratch with another design - but maybe it's not possible. And I would like to be able to make the upgrade without any modification to the mother board, the CPU board and the other 16K RAM board. I haven't seen the Hays mod (got a link? 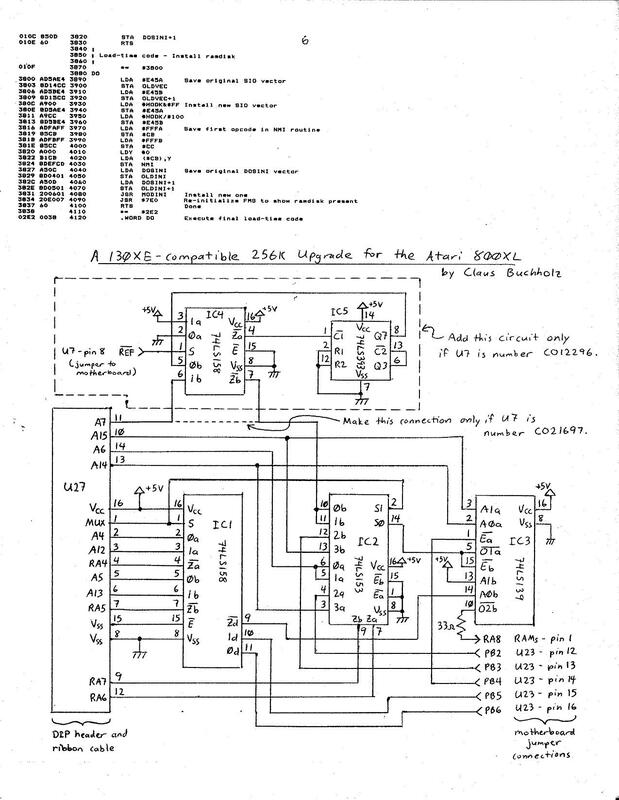 ), but it should indeed be possible to upgrade an Axlon 128K board to 512K. Yes I'll have a look at improving the refresh circuit. I change my diagram and post it again so you can perform a last check on it. Could you tell me to which pin of which chip in my diagram I should connect the pin 6 & 7 of the 74LS158 of your dotted diagram, please ? Can't you just use an ANTIC from an 800XL or 600XL? It will re-fresh 8 bits all on its own. "Passionately" will test re-fresh for you. Let it run for 30 minutes, or so. Your LS175 pin 15 connects to my LS158 pin 6. My LS158 pin 7 connects to your LS158 Z503 pair pin 6. Replacing ANTIC will not fix the refresh because A7 goes to the column address on this board, not the row address. Of course you could modify the board to run A7 to the row address, if you had a newer ANTIC. It is a small PCB that attaches with one clip to (IIRC) the OS board. Here's a link, but I'm afraid not much is there in the way of info. Here is the updated diagram. Looks good to me. Good luck. Many many thanks for the help on the diagram ! I now have a 800 with Axlon compatible memory which is recognized by SpartaDos X !!! I am very happy. Thank you very much. Yes, there is a a small problem. SpartaDos X sees only 7 banks instead of 15 ! Only 128Kb is accessible instead of 256Kb. To be sure that this is not a problem of, say, bad soldering, I built a second set and I have the same result. Now I have 2 sets to upgrade a 800 but only with 128Kb (which is already a success for me !). So I guess there are 2 things to check. - the first one is the logical diagram. Could there be a small problem which prevents to see the full 256Kb ? - the second one is my PCBs. 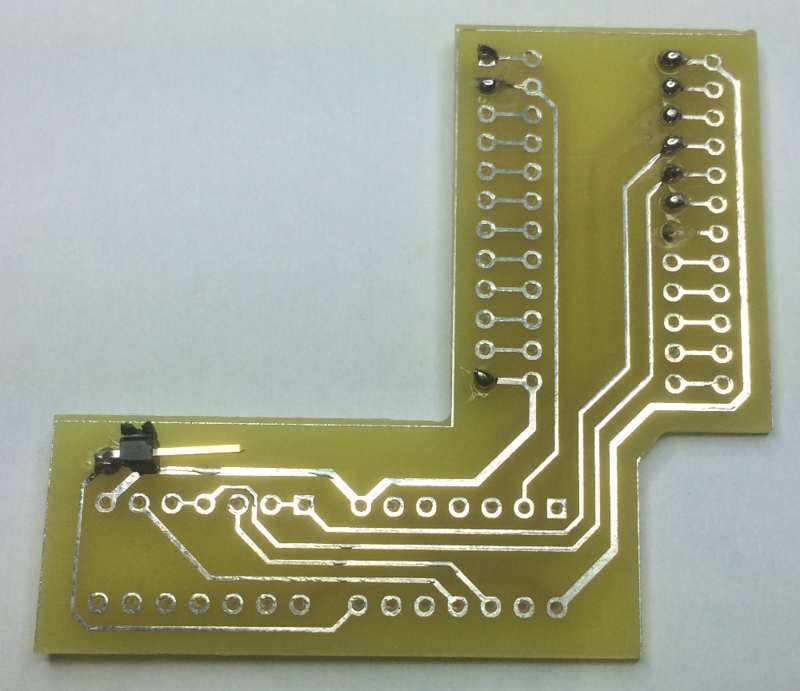 I designed a 2 PCB (one for the ROM board and one for the RAM board) to avoid making tons of wires between chips. But maybe something is not compliant with the logical diagram ? Could you please have a look again at the logical diagram and tell me if you see something which could cause the problem ? Or maybe you have an idea of this result ? Edited by ebiguy, Sat Sep 26, 2015 4:41 PM. Your schematic does not show power and ground for the chip labeled 74LS158 Z503 pair. 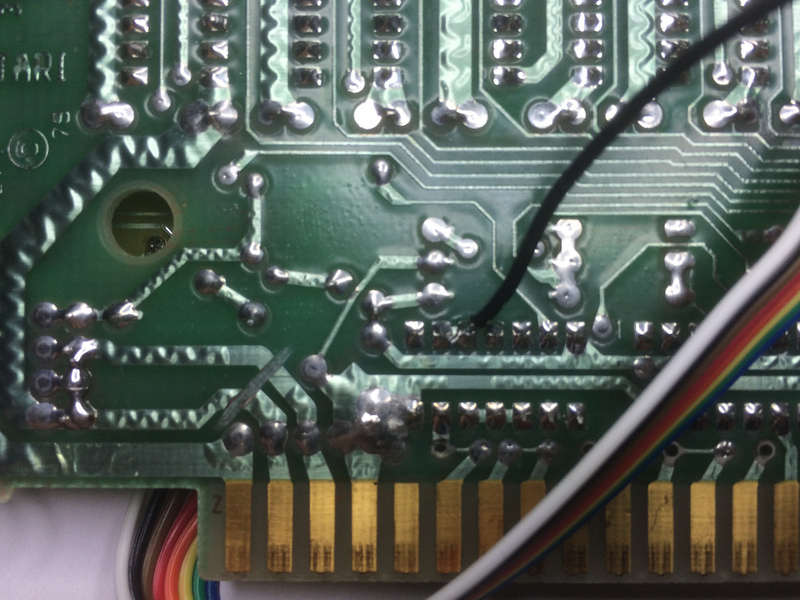 Did you wire pin 16 to Vcc and pin 8 to Gnd? Does SpartaDOS support a 256K Axlon? AFAIK Axlon only ever made a 128K RAMdisk board. Yes, I wired all Vcc and Gnd. I did not know that Axlon made only a 128K RAMdisk. I use the same SpartaDos X in Altirra emulator and when I configure it to have 256K of Axlon memory, SpartaDos X detects all 256K RAM. So I guess the SpartaDos X RAM detection routines tries all 256 values for CFFF address. The problem is probably in hte circuit board, not in SpartaDos X. By the way, Let me show you how it looks. 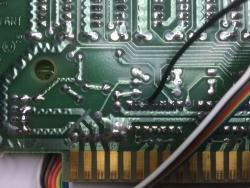 It's neat and the best of all, as I said in a previous post, nothing need to be cut or soldered inside the atari 800. 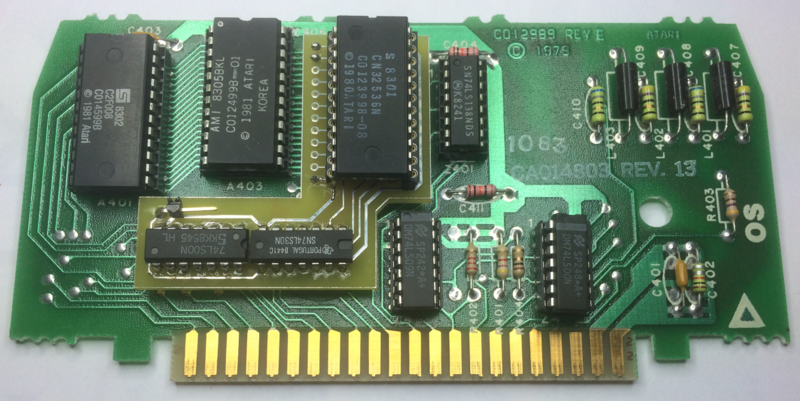 I used ExpressPCB to design 2 PCBs, one to fit on the ROM board and one to fit on the RAM board. While Axlon may only have made 128K boards, Magna Systems made Axlon compatible boards from 256K to 1M. Does SpartaDOS keep a list of the working banks somewhere, which we can PEEK to help with debugging the hardware? Of course you could write a small BASIC program to determine which banks are working. So the problem is not SpartaDos X but really the pcb. If I post both ExpressPCB files (.SCH: schematics and .PCB: double sided pcb layout), could you check that it follows the logical diagram you validated in a previous post ? So bit 3 of the bank register is not working. That's Q3 in the schematic or the circuit it runs through. Question: where did you solder the black wire which goes to LS158 pin 1? I will double check the posted schematic. You check the PCB. I don't have ExpressPCB. Impressive ! How did you know that it was the black wire ? 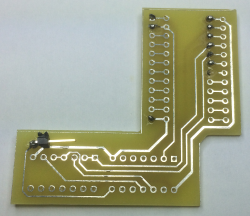 The black wire is soldered to Z501 pin 2 as shown by the picture of the back of the PCB. 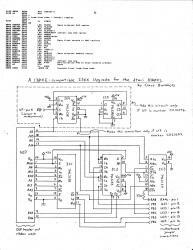 I also checked the PCB several times and I am quite sure that it conforms to the logical diagram. Thank you again! I appreciate all the time you spend on this upgrade. Edited by ebiguy, Sun Sep 27, 2015 3:01 PM. I don't understand. Did you fix it? Do you see 16 banks now? I really fail to understand why the Z503/Z504 pair of added 158s are not timed (pin 1) with the rest of the 158s on the board? Shouldn't all those pin 1s be tied together? To say nicely done ebiguy is a vast understatement. He noticed the black wire taking off in picture #5 to answer how did he know it was black? This happens to be the wire I'm concerned with above too, easy enough to try it connected to pin 1 of the original 158s there. Address multiplexing would then occur at the same time - I would think different timing for some rows/columns could lead to a world of troubles. And then just maybe it happens to be the same time so no real improvement to be had - but this I don't know. I am sorry if you misunderstood my previous post. I meant how did you know that the black wire went to pin 1 ? You don't have the full PCB in your hand ! Anyway, as I say above, I double check the PCB and I see no error compared to the logical diagram. When I red your message, I immediately tried to unsolder the black wire and solder it to the pin 1 of another 74LS158. But I still have 8 banks ! This really is a mystery.